Started this discussion. Last reply by Chris RAlph May 30, 2018. Here's Johnny Bee Good in a beeyard near Hastings Ontario in August 2011 making ready with his hive tool to remove the queen excluder, which is a metal screen that restricts the queen to the brood chambers below. This keeps eggs out of the honey supers above - you can see the super has been removed and now sits upright beside Johnny. 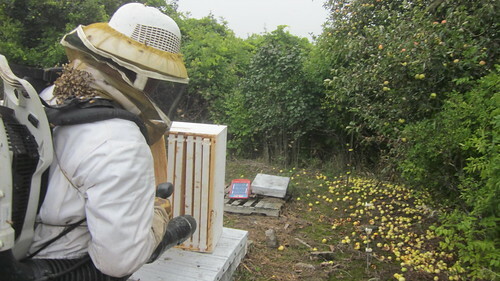 I wrote about the 2011 honey harvest was near crop failure, on Son of a Beekeeper , my Tumblr blog. After spending time with another local beekeeper and helping harvest his annual summer honey crop this son of a beekeeper has become even more acutely aware of the various honey regions that are waiting to be discovered by North American kitchens , across the province of Ontario. Talk about 'making hay while the sun shines'. Here's a short video I shot on Saturday June 16th 2012 of my nephew Ryan baling hay with his New Holland 658 hay baler. The grass feed is a mixture of alfalfa, red clover and timothy and as such will make excellent feed for the growing numbers of cows on their feedlots. Some black bears did launch an attack on of our remote beeyards last week! This is what bear damage looks like, and it could have been a lot worse. The total loss was only four frames of brood. And that's because this beeyard, like all of our locations in southern Ontario, is protected by a heavy duty solar fencer. Hello from Rob Campbell the original Son of a Beekeeper in Ontario Canada.